The V10 clap skate has a flexible tube. This tube is made of high quality aluminum and is bendable. The folding mechanism of Raps is the strongest on the market and therefore is extremely reliable . This bracket is unique in skating . Previous aluminum brackets were used Raps follows from other speed sports like for example the F1 . The bracket is made of glass and carbon fiber reinforced composite . Extremely light and extremely reliable. Обычная цена: 29 460,96 руб. The V10 iron differs from the V8 by having a glued PM (powder metallurgy ) steel blade . 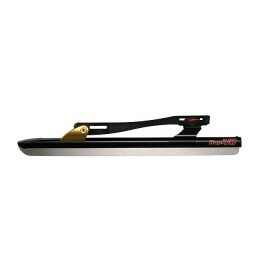 In 1991 Raps PM steels introduced in the skate industry , continuing a standard that the competition can not be carried through a few years back . PM steel has a finer surface and sliding further . Through years of experience with this steel Raps remains a piece rapper . Also brings Raps this knife since 1991 to a hardness of more than 64 HrC . Any harder does not make sense , the knife is not finer , but more brittle and breaks easier than previously . < / P > In contrast to a steel tube is a curved aluminum tube to maintain its curved shape . The folding mechanism of Raps is the strongest on the market and therefore is extremely reliable . The bracket is unique in skating . Previous aluminum brackets were used Raps follows from other speed sports like for example the F1 . The bracket is made of glass and carbon fiber reinforced composite . Extremely light and extremely reliable. The V8/V10 has a steering other than the famous V12 ( Axle ) tubes because the round aluminum tube has flexibility . The V10 is bendable (read flexible ) through the tube and super sliding properties by the PM steel, the response of raps on the steel tubes of the competition .